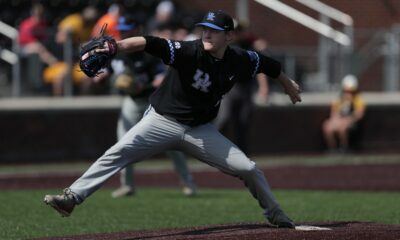 UK Starter Mason Hazelwood gets the W.
The Kentucky Wildcats got back on the diamond Tuesday night against the Morehead State Eagles. 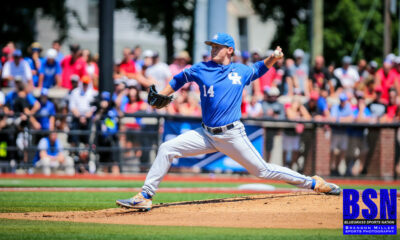 Kentucky was coming off a three-game series losing sweep against SEC opponent Texas A&M. 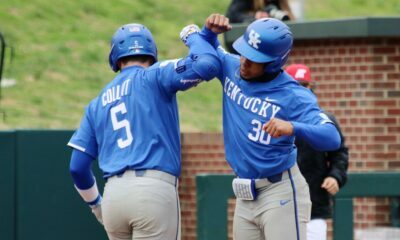 Coming into the night Kentucky was 14-10 overall on the season and looking to pick up a win before another three-game weekend series against SEC opponent Georgia. Morehead State came into tonight with a 17-7 record and looking to pick up a big win against Kentucky. Mason Hazelwood got the start for Kentucky and was 0-1 on the season. G. Rogers got the start for the Eagles who and was 2-1 on the season. 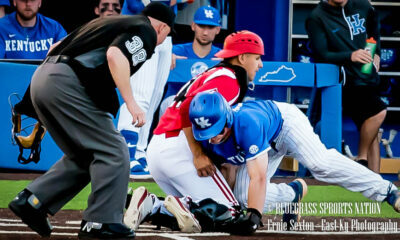 Kentucky got the bats going early, in the bottom of the first inning, Dalton Reed reached on a fielding error by the second basemen, scoring A. Schultz. E. Curtis grounded out to second base, scoring T.J. Collett, for an unearned run. 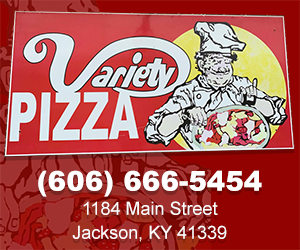 The next few innings remained scoreless until the Cats got things going again in the bottom of the fifth inning. In the bottom of the fifth inning, T.J. Collett reached on a fielding error by the shortstop, scoring A. Shultz. Jaren Shelby reached on a throwing error by the shortstop, scoring T.J. Collett and Ryan Shinn, both runs unearned. In the bottom of the sixth inning, Cam Hill reached on a throwing error by the pitcher on a Sac bunt, scoring C. Kessler. In the bottom of the eighth inning, C. Kessler reached on a fielder’s choice, scoring Jaren Shelby. Kentucky ended the game winning with a final score of 7-0. Hazelwood picked up the win tonight putting him to 1-1 on the season. Rogers got the loss tonight for Morehead State putting him to 2-2 on the season. Kentucky gets back on the diamond Thursday at 7 PM, Friday at 6:30 PM, and Saturday at 2 PM against the University of Georgia. Kentucky is now 15-10 on the season and still remain 0-6 in SEC play but looking to improve that this weekend. Recap: Kentucky was led at the plate by Jaren Shelby going 2-3, Dalton Reed going 1-3, C. Kessler going 1-4, and Ryan Shinn going 1-4. Ryan Shinn got his twelfth double of the season, which ties him seventh nationally. Mason Hazelwood pitched six full innings, allowing one hit, striking out seven, walking one, and threw ninety-seven pitches. Tonight’s game was the third shutout of the season for the Wildcats. 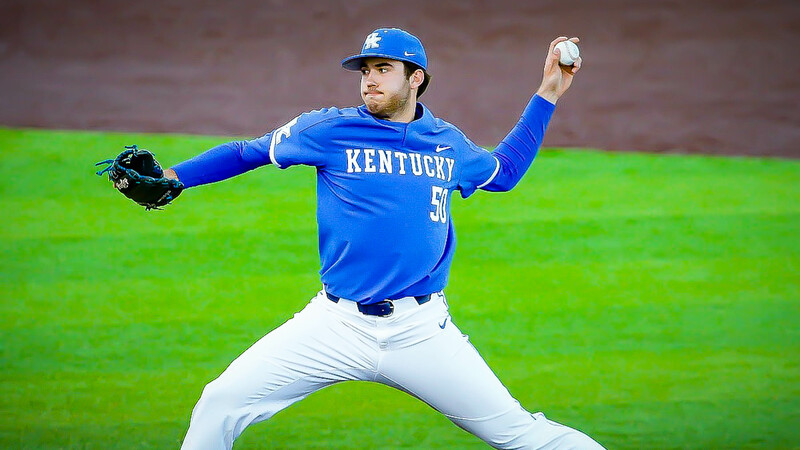 Kentucky threw three different pitchers tonight including Hazelwood, C. Ayers, and Hunter Rigsby. Kentucky left five runners on base tonight, committed one error, had six hits, and scored seven runs.